Creepiest Post of the Day: Screaming, Furry, Nearly Indestructible Bugs?!! Okay in some way this has got to be the GMO companies, and the government’s Black Bag projects at work. :). 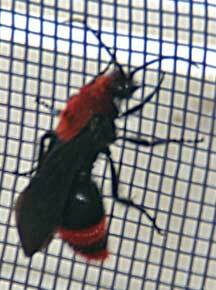 Give a reading here, and when done listen to the good folks at B-MOVIE CAST here (around the 20 minute mark) discuss trying to kill, the near indestructible RED VELVET (COW KILLER) WASP/ANT! Vince of B-MOVIE CAST mentions trying to kill one of the huge bugs by stepping on it (a natural reaction, I would think to a blood red bug, the size of a few bees on hormones crawling toward you), only to have its head and upper body walk away from the crushing with it making a bloodcurdling screaming noise. p.s. The pic is of the wimpy male, The female has no wings, and is the one in the habit of killing anything that bugs it. Just like human women. I’m JOKING!!!! !